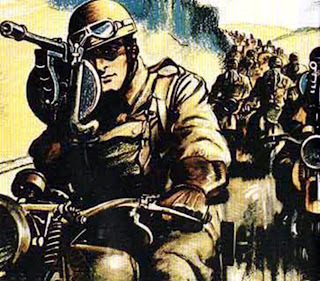 Britain approached war in 1939 expecting motorcycles to play a key role. A mechanized army would escape the costly trench warfare of World War I. To prepare for mobile combat, the War Department spent the years between the wars testing the best machines the British motorcycle industry could produce. The testing was tough. The frame of a pretty Royal Enfield Model B twisted. It was built too light, but other motorcycles were judged too heavy. A decade of time, money and effort went into choosing the very best equipment for the British soldier. Royal Enfield, Norton, Matchless, Rudge, Triumph, Sunbeam, Ariel, BSA and New Imperial all competed. In the end, the winner was: necessity. The British Army lost much of its best equipment in the evacuation from Dunkirk. To re-equip, Britain rounded up civilian machines, often still in civilian colors, and remounted its dispatch riders and reconnaissance units. All manufacturers provided what they could. The little 125cc Royal Enfield even went to war in a metal cage, dropped by parachute to airborne troops. The result of necessity and creativity is that British military motorcycles existed in terrific variety on every front. Pictures of them are fascinating. Gavin Birch has mined the archives of the Imperial War Museum for Images of War, Motorcycles at War, a Pen & Sword military book. 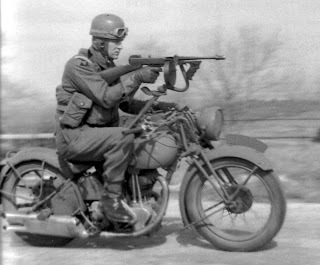 Chapters on German and American motorcycles are included, but naturally, given the source of the pictures, they tend to show them in use by British soldiers. This is a book about the motorcycles of World War II, although the Great War and inter-war years are mentioned. Not surprisingly, the book is printed in black and white, as nearly all the photos must have been, and the mud-splattered olive-drab motorcycles all turn out about the same shade of gray. It's hard to tell one from another except where the manufacturer cleverly included an unobtrusive brand name where the military markings wouldn't obliterate it. This is a problem for Birch, as he quite often doesn't have adequate caption information to go by. We might be told the hometown of the soldier in the picture, but not what machine he's riding. Not many of the pictures in Motorcycles at War actually show warfare. Some were technical pictures and some were pure propaganda. Birch does his best, as when he notes that the cover picture of airborne troops unpacking their motorcycles is obviously posed, since no parachute rigging is attached. In the end, the pictures are priceless but the captions are so aggravating that the book loses authority. I am especially grateful for the solution to one mystery, however. For years I've treasured a cartoon image I came across on the Internet with no source or information listed. A troop of obviously British Army motorcyclists is shown roaring along, aiming submachine guns attached to their bikes. It is a stirring but fanciful illustration. Incredibly, it is not complete fiction. 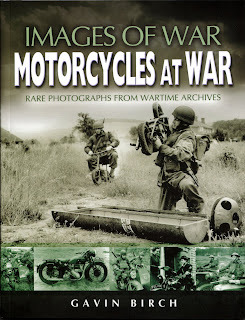 Motorcycles at War includes photos that obviously inspired the image. Birch explains that the "Tommy gun motorcyclists" were tested, but never used in war. Some of the images in Motorcycles at War and many more can be found and even purchased on the web site of the Imperial War Museum. Just search for motorcycle / Tommy gun, for instance, and you'll see thumbnails of your choices. Thank you for an informative comment.